Tenth place seemed about right for Partick Thistle last season, given that they never seemed poor enough to deserve relegation, yet they struggled for long periods in the campaign, particularly at home. In fact, after their bright start, they won only five of their last thirty-three league games. But Alan Archibald's side achieved what they set out to do - consolidate their top flight status. Doing so again would be quite a feat. The Harry Wraggs haven't managed three consecutive seasons at this level in nearly twenty years. Finishing higher up the league would be even more impressive, as goalkeeper Paul Gallacher is the only player who was born before the last time they finished above eighth in the table, all the way back in 1981. So history is against them a wee bit, then. And at the moment a repeat of last season's scrap doesn't seem too unlikely. Reinforcements have been rather sparse so far, though Alan Archibald has tried out more trialists this summer than he would probably care to remember, He has been particularly searching for a left back to replace the superb Aaron Taylor-Sinclair, who earned the chance to move down south. The rest of the defence often struggled to make the step up from the Championship, although it was stabilized by plugging Lee Mair in during January. The man affectionately known as "Night" has been punted though, in favour of younger options. But Conrad Balatoni, Aaron Muirhead and Gabriel Piccolo all looked vulnerable last season. Having a fully fit Stephen O'Donnell available again at right back is a boon, at least, and Gallacher is a reliable old hand in goal. As for left-back, Jordan McMillan is the incumbent until Archibald finds someone better. If the backline is a source of worry, so too is the forward line. Lyle Taylor scored a few goals after joining on loan in January, but was just as important for his holdup and link play. But he has gone, leaving the hardworking but limited Kris Doolan as the only senior striker at the club. Doolan did manage 11 goals last season, far more than expected, but Thistle really need to bring in an alternative or two. If only they could just play a team of midfielders; maybe this is in fact the manager's grand plan. In Stuart Bannigan and Gary Fraser, they have two young creative players who are getting better and better. After Isaac Osbourne inevitably got injured last season, they suffered from not having a ball winner in the middle of the park, which is a role that powerful new signing Abdul Osman is expected to fill. If Osman proves a disappointment, then at least the solid Sean Welsh is back after a long-term injury. The attacking threat from midfield will come from Kallum Higginbotham and Ryan Stevenson, the latter of whom has joined from Hearts. Stevenson is far more effective in a central role, but may be required to come in from the wide areas like Higginbotham, good for a few spectacular goals each year but frustratingly erratic, will. Or he may even be used as another option up front, where he filled in on occasion at Tynecastle. However, if either of them get injured, or struggle, Partick will have a problem, as the alternatives, Christie Elliott, James Craigen and Steven Lawless didn't look up to the challenge last season. I'm surprised they haven't been let go in order to free up space for new faces. Archibald likes his full-backs to provide width, and he'll need them to do so. As the start of the season beckons, it feels like a lot of work still needs done at Firhill. 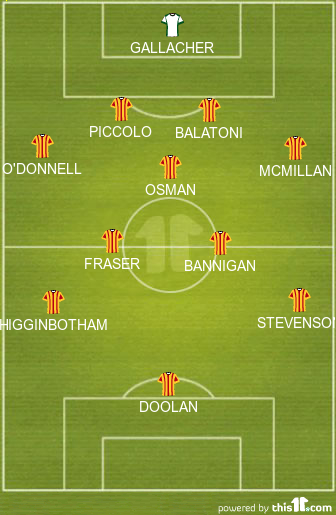 Partick Thistle can be guaranteed to play good passing football and to take the game to the opposition. Unless they can strengthen at both ends of the pitch, they are also probably guaranteed to finish in a similar position to last season, and to face another battle to avoid the drop. @Nareystoepoker can't disagree with too much except Piccolo has been frozen out & hasn't played pre-season games & Welsh still not fit. @Nareystoepoker squad is very thin right now, Archie gambling on players becoming available as other (English) teams finalise their squads. @Nareystoepoker Jeez, did you ever see him play? !